Each guest room at El Castell Motel is equipped with modern décor, comfortable bedding, and lifestyle amenities that will make us your favorite place to say when you visit Monterey, California. Our guest rooms range from one king to spacious rooms with three queen beds and multi-room suites that all include touches like hardwood floors, complimentary WiFi, microwaves and refrigerators, Keurig coffee makers, a desk and table, and complimentary local calls. Our accessible rooms are fitted with a choice of a roll-in shower, or tub shower each with a shower seat and stability bars, closed-captioned TVs, lowered shelves and racks, and wheelchair access throughout the rooms. Whether you are traveling alone, or in a group of six, for business or leisure, we offer accommodations that are an ideal fit. 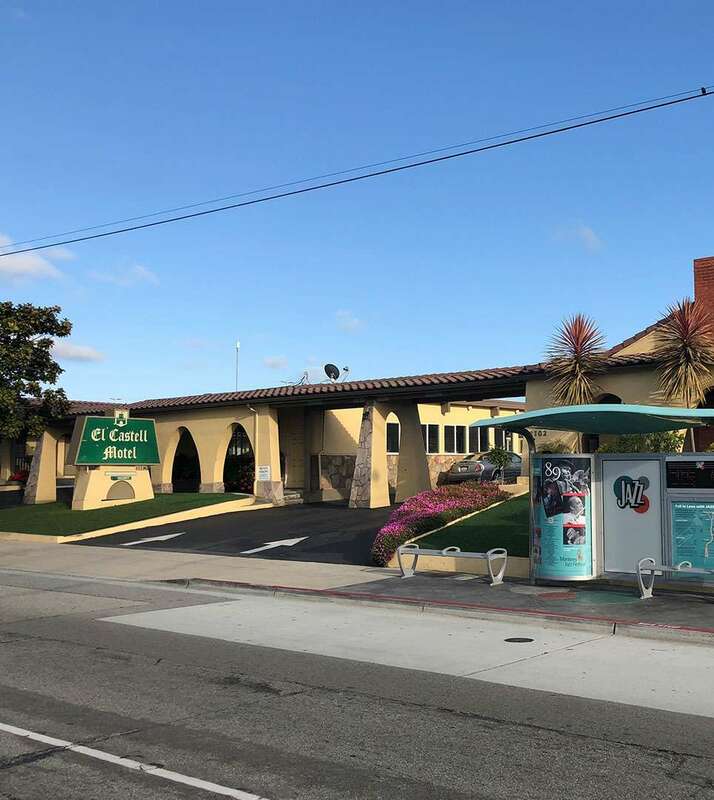 The El Castell Motel in Monterey, California offers superior rooms and amenities at affordable rates. We have a 24-Hour Cancellation Policy. If you wish to cancel or modify a reservation, you must do so by 3 PM 24-hours or 1 day prior to your arrival date. If you cancel or modify post the expiration of the Cancellation Period or you fail to show up, a no-show charge will be levied on your credit card for one full night plus tax. Non-refundable reservations cannot be canceled or modified - total reservation amount will be charged in case of cancellation or no-show. El Castell Motel is located on Fremont Street in Monterey, California. Our excellent location allows our guests to access highway 1 effortlessly and we are minutes from top local landmarks, attractions, and restaurants. We are a short drive to Pacific Grove, Carmel-by-the-Sea, and Pebble Beach. Our 100% smoke-free Motel provides spacious and modern boutique style guest rooms and suites. We are proud to offer services to enhance our guests’ stay like a friendly and helpful 24-hour front desk staff, complimentary on-site self-parking, complimentary WiFi, an indoor heated pool, complimentary local calls, and guest laundry facilities. One child 15 years and younger stay free of charge when staying with a parent or guardian and using existing bedding. Additional children or adults incur a fee of USD 5.00 per person, per night when using existing beds. There is no capacity for extra beds in the rooms. This property is privately owned, and the management reserves the right to refuse service to anyone and will not be responsible for accidents or injury to guests or for loss of money, jewelry or valuables of any kind. Once checked in, no cancellations. All linens are inventoried: missing or damaged linens will be charged. Any damages to hotel property will be charged an additional fee upon assessment. NO PETS ALLOWED. Guest rooms that have evidence of pet dander and/or odor will be charged a non-refundable fee for deep cleaning services. Any damages to hotel property will be charged an additional fee upon assessment. This is a NON-SMOKING facility. Guest acknowledges that smoking is not allowed in a guest room or within hotel facility. If anyone in guest's party smokes in the guest room, guest hereby expressly authorizes hotel management to charge credit card the amount to reimburse the property for the additional cost of cleaning guest room. If your reservation has been paid in advance or you elect to pay by cash, a security deposit via credit card will be required upon check-in and will be charged in the event that damages outlined herein occur. The hotel takes a credit preauthorization but does not accept cash deposits.